The Larkspur Fire Muster, a traditional fire service competitive event, full story coming. 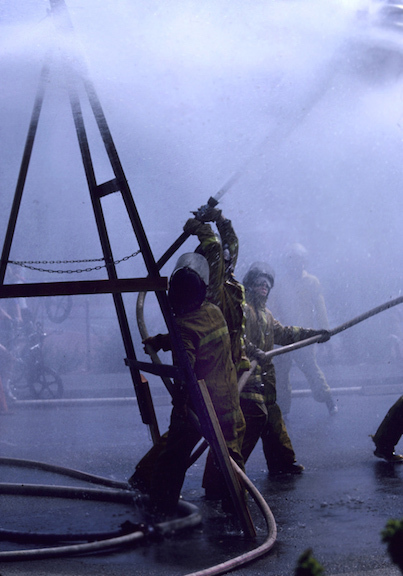 The Larkspur Fire Muster was a regional competition that ran for seven years, from 1978 to 1984. It attracted teams from Northern California, and featured events such as a firefighter obstacle course featuring multiple skills, a hose cart race that included antique equipment, using Larkspur's restored hose cart and the 1850 Austrian Hand Pumper, a barrel water fight, a 'make and break' hose coupling race, and the "Human Hose Clamp" hose extension evolution shown below. Also included in some years: A Chief's race with spouses, a pie-eating contest, a booster line pull race, and, during the drought, a contest to fill a bucket with dirt at a distance using a shovel and overhead throw. More information coming soon. Elmer Collett, retired NFL 49'er player and now retired Kentfield Firefighter, pictured competing in the "Human Hose Clamp" event at the Larkspur Fire Muster. Normally several firefighters would 'clamp' the 2.5 inch charged hose line, but Elmer did it all by himself. Photo courtesy of Tom Forster. The beer barrel water fight was a popular event at the Muster, where two teams with two 1.5" landlines each would compete pushing the barrel overhead past the other team to the end. It was usually the best of fine or seven. Photo courtesy of Tom Forster.